My mom has come to visit. I live in Texas, she lives in NJ and she has flown out to be with us till March 5th. As a result, my posting will be a bit short and not so often. We will be going to a wedding in MO over the weekend. Life gets busy when there is visitors! Not everyone is fortunate enough to have family and I am glad for my large one. Enjoy your family while you can, they are not with us forever. I will be enjoying my mom! Kids sure can make a mess. A really messy mess. A really cute messy mess! It takes a lot of patience to let them learn things for themselves, but it is something that is needed. So many times parents do not want them to make a mess and as a result do not let them learn. 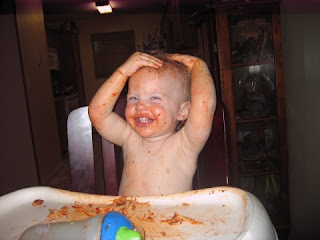 I finally got some of my pictures back from my computer melt down two weeks ago and would like to share three grandkids whose mommy’s let them learn by making a mess! 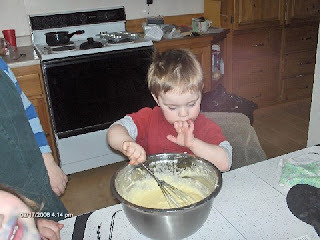 This is Chris helping make a cake for his mother. He is doing quite a good job I think, even tasting it to be sure that it is going to be good! This is Scout. Scout loves to do things for herself, including eat spaghetti. Below is Lexi, also eating her spaghetti. I decided to make this post part of the Natural Mommy’s Meet and Greet. So go there to see more cute pictures (Some are even of my granddaughter! Do not use credit cards! 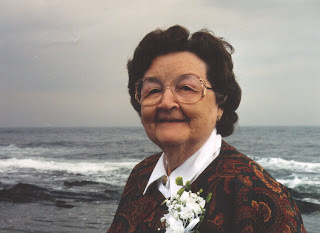 Today is Frugal Friday at Biblical womanhood and I wanted to share something with you. When you get done reading here, click on the link and go to Biblical Womanhood for more ideas. Many years ago I made a mistake that I realize now many are making. In an effort to be frugal I would see things on sale and buy them using the credit card. I was “saving so much money”, or so I thought, that it was worth it to get it even though I did not have the cash. What happened next was the bills came in. I was new to credit cards and did not realize how much that purchase was costing me. Way more than full price till it was paid off! Cards that allow you to transfer funds at 0% interest often charge a lot for spending that is not transferred. They then take the payments off the 0% interest first and you are stuck paying interest for that sale item until you get the rest of the balance off of there. Do not use cards to save money! Not unless you pay them off as soon as the bill comes in, then it may work. I say may, because many cards are now doing 2-cycle interest, in which the interest is carried over for two payments and there is no grace period. Frugal ladies, keep the card in your purse and use cash, or you are not being so frugal. Today is Works for me Wednesday and I want to share something that really works, not just for me, but for most wives. Some time ago I wrote about honoring your husband and how today’s women seem to have a problem in that area. Yesterday I was reading some of the blogs I normally read and went to Real Life’s post “All Husbands are idiots…” It is not what it sounds like and really worth reading. As I read her post I was thinking about what works for me. I am in my second marriage, both to wonderful men. My first marriage was for 29+ years and ended when death parted us. I am now married to another man who is a gem also. While I can’t take the credit, because I feel God is the one to get all the credit, I can tell you some things that I do and do not do that I know makes a difference. Both husbands have told me so. I praise my husband. He has many good features that are worth praising. I talk positive about him to others. My talk is uplifting, letting others see his good qualities. No negative talk to others. If i have had a problem that I did not know how to handle I sought out someone older and wiser and one that had enough wisdom and sense to not hold anything against my husband (and to keep their mouth shut!). This has almost never been an issue, but in 29+ years of marriage there were a few times where I was dwelling on negative and could not see it. It is ok to tell funny stories, if they are not degrading. We have some funny things that happened that could be told in a negative way, but yet do not have to be. For instance, and my husband would tell you this one himself if he were writing, he has a bad throwing arm. We live in Texas and sometimes there are rattlesnakes in the pasture. He was crossing the pasture to look for a cow that was down and saw the snake in the path. Rick decided to hit it with a rock. He threw, missed, threw missed, and so on until he had this nice fort built up around the snake. That snake was peaking out the hole, sticking it’s neck out, then its tongue out and hissing at my husband, then ducking back behind the fort. I had to go out to the pasture with a shovel to kill the thing. (He did the killing, eventually). My hero! We laugh, but I could make that into something really negative and put him down to someone. I try to make dinners he likes, get him drinks when he is working hard and such little things to show my love. My list goes on, but by doing these things it keeps my mind in a positive frame, shows him I love him and keeps us close. It also works to make him want to live up to what I think of him. He changes as I change and it works for our good. This works for me! For more works for me ideas go to Rocks in My Dryer.